Posted on January 12, 2007	by Linda S.
I’ve always admired knitters. Even though I have known how to knit and purl for a very long time, I have never had anyone around who could teach me the finesse points of knitting. Hooray for the internet! 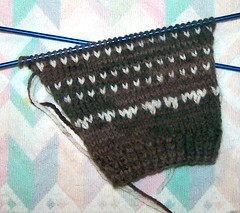 Over the past several months, I have enjoyed the blogs of Mariella at Knitting Nonni and ~firefly’s I live on a farm. They have inspired me to look a little deeper into knitting. And look what I found…!! Knitting Help.com has video tutorials for everything … casting on, casting off, seaming, knitting in the round…. I love this site! There are also free patterns. This piece of knitting began as a fingerless mitten for myself…then I thought hmmm…this is the perfect size to try 2 colors… so I did. Amazing…if I could learn to count to 3…grin Have a look! This entry was posted in Free Patterns, Handcraft, Handwork, Knit, Tutorials. Bookmark the permalink.